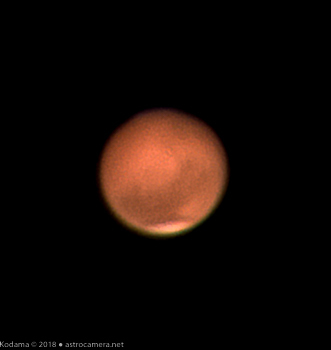 Our closest approach to Mars took place 6 days earlier, but I wasn't able to do any imaging of it because power in the surrounding area was lost for over a week due to a nearby fire which damaged power lines. However, I was happy to experience relatively good seeing for this evening. The dust storm which covered Mars also appears to be clearing a bit. Imaging and processing was the same as in a previous imaging session.